I'm calling to urge to vote against any efforts to use the CRA to dismantle the FCC's broadband-privacy rules. Internet service providers have access to every piece of sensitive data that flows across their networks and the FCC's rules protect my information from misuse. Thank you. Congress wants to make it easier for companies like AT&T, Comcast and Verizon to violate your online privacy rights. They're planning to use a sneaky process called the Congressional Review Act (CRA) to overturn rules the Federal Communications Commission passed last year that protect how your private information is shared with online advertisers and other companies. The CRA wouldn’t just wipe out these hard-won privacy rules — it could also block the FCC from ever passing new ones. Broadband monopolies want Congress to let them violate your online privacy and sell information like your web-browsing history to the highest bidder. 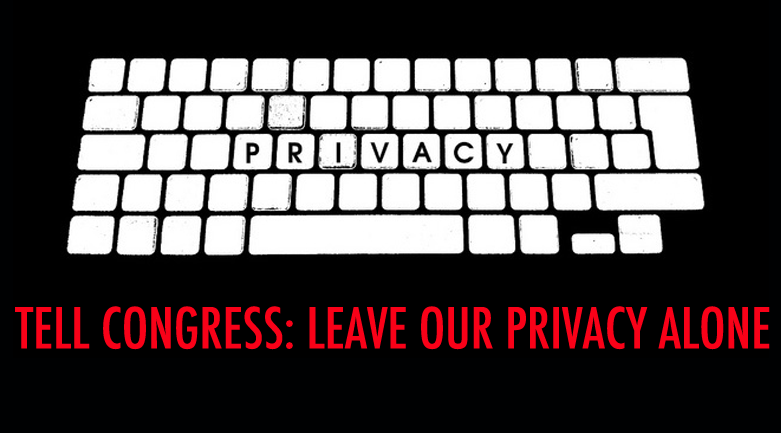 Stand up for your internet privacy: Tell your senators not to use the CRA.